Barricaded criminal suspects, terrorists controlling a shopping center, an active shooter in a school are signs of our times and with it, a constant demand for law enforcement officials to undertake the most demanding of special operations with speed and decisive action, e.g. hostage rescue. Providing tactical response in high-risk law enforcement situations, national and local hostage rescue teams now function as first responders in domestic counter-terrorism events and threats. Coordinating manhunt and rural operations. To a lesser extent, hostage rescue teams may deploy individual operators to act as snipers and/or provide protective service details for high-profile witnesses or dignitaries. Aside from hostage rescue, teams at home and abroad also perform typical law enforcement activities, such as making arrests, processing scenes for evidence recovery, and testifying in court. 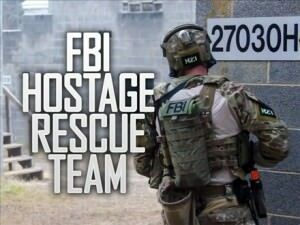 Select FBI Special Agents, either from service within Field Office SWAT teams, or direct participation in the FBI’s Hostage Rescue Team (HRT), are well versed in the prevention, strategic considerations, planning, conduct, and coordination essential for staging a successful rescue. Whether the interest resides in equipment selection, team training, team tactics, incident scene intelligence, containment, crisis negotiation, or covert approaches, the FBI affords an unequaled sampling of current subject matter experts. Directory members can be extremely helpful to anyone seeking information or requiring a professional opinion concerning hostage rescue. Looking for an expert concerning hostage rescue—visitors need only use the website’s search feature, entering the appropriate skill, as well as the geographical area of preference to make contact with an FBI specialist. Retired FBI Agents and Analysts with a background in hostage rescue, interested in securing a Directory listing and/or a personal email address, need only submit a brief online application to join the website.